Perhaps because real Broadway news has been slow this week, the rumor mill has been active circulating rumors about new shows. First – the New York Post reported that the New York Theatre Barn is wooing Lea Michele for a new musical based on the real-life attempts of a high school in Texas to produce Rent. The show, called Speargrove Presents, has a role written for her, but with her Glee filming schedule, taking time out to star in a non-profit’s musical just may not be in the cards. That said, she has been a fan of the Theatre Barn for years. I’m waiting to see whether any other names come on board for the project. Until they do – they can pine for her all they want – were I her agent, I’d tell her to politely decline. Also rumored, this time by Variety, is that the Jeff Buckley jukebox musical adaptation of Romeo and Juliet called The Last Goodbye is eyeing a Broadway premiere during the 2010-11 season. A concert version of the show was presented this past May at Joe’s Pub with a cast that included Kelli Barrett (The Royal Family, Rock of Ages) and Theo Stockman (Hair, American Idiot). After doing a workshop at Gotham and an out-of-town tryout somewhere yet-to-be announced, they’re hoping to hit the Great White Way. Anyone catch the Joe’s Pub performance? I think this show could either be really good, or do a big old flop. 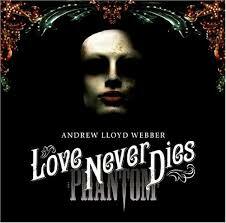 The Phantom Love Never Dies soundtrack is being released on March 9. We hooked you up with a sample of some music from the show. Be sure to pre-order your copy of the full cast album now! 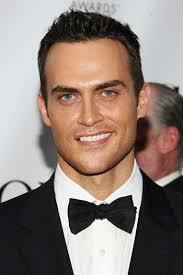 The Matt Stone and Trey Parker Morman Musical, starring Cheyenne Jackson, will officially make an appearance Off-Broadway in the 2009-10 season. I am so on board with this show. 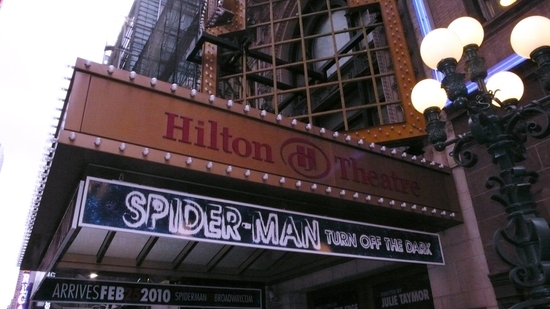 Speaking of Julie Taymor – the now $45 million dollar production of Spider-Man: Turn Off the Dark that was supposed to start previews earlier this month under her direction – “will open before the end of the year” according to U2’s the Edge. They’ve already run into hurdle after hurdle, found an entirely new set of producers, and returned money to those excited fans who bought their tickets months in advance. I really want to think the best of this production, but have to admit, I’ve grown wary. So, the Edge: Thank you for trying to inspire confidence, and I hope for the sake of those who gave you all the $45 million you’ve already spent, that you do, in fact, go up before the end of the year, but I have to tell you – I’ll not be holding my breath. In West End news – Tony and Olivier Award-winning director Trevor Nunn will direct Aspects of Love, the Andrew Lloyd Webber musical for the Menier Chocolate Factory this summer. This wonderful theatre has contributed a lot to Broadway in recent years (Sunday in the Park with George, La Cage aux Folles, A Little Night Music), so if its a successful revival over there – it’s likely to make its way across the Pacific. And finally in other redo moves – Variety is reporting that Karen McCulluh and Kirsten Smith, the writers of the film Legally Blonde, are set to create a big screen remake of The Best Little Whorehouse in Texas. The film will be produced by Marty Bowen and Wyck Godfrey, of the “Twilight” franchise. First of all – why redo it? Secondly – what a weird assortment of people. I can only hope this new version will feature vampire prostitutes with chihuahuas! Thought you guys might appreciate this video from the Upright Citizens Brigade called “Takin Care of Business, The Musical.” It’s a parody of jukebox musical commercials and it’s really funny!